For this guest post, I am delighted to welcome Javier Moreno Rivero, who hails from UCLA (the University of California, Los Angeles). He has a special interest in legal translation, both in academic terms and in practice, with a particular focus on less common languages and migration, and is also the organiser of a highly successful event on jurilinguistics held in Seville last year. 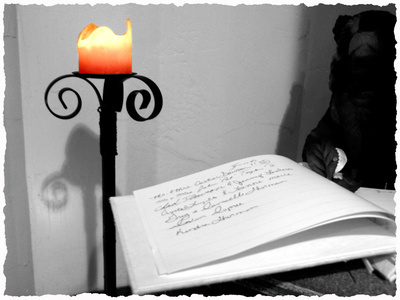 In the report below, Javier shares with those of us who were unable to be there his personal view of the recent conference held in Freiburg, Germany. Over to you Javier! September is always a fresh month to start over with conference and training opportunities. From the 7th through the 9th, the relaunch of the International Language and Law Association (ILLA) took place in Freiburg with a conference entitled “Language and Law in a World of Media, Globalisation and Social Conflicts”, which gathered a number of leading scholars in both fields. Three days of intensive, yet unique, lectures and workshops on legal linguistics, law, language, and, of course, legal translation. From the beginning of the conference, “interdisciplinarity” stood out as being needed and represented in the room to stimulate and address research methods in legal linguistics. The first session was opened by keynote speakers Professor Lawrence Solan (Brooklyn Law School, USA) and Professor Ruth Breeze (University of Navarra, Spain). 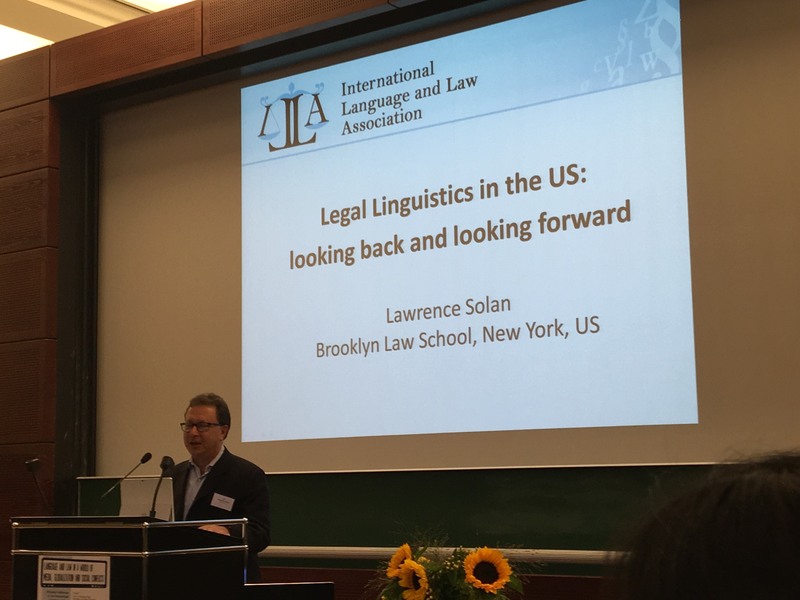 Solan took us on a fascinating journey through the development of legal linguistics in the United States: from Peter Tiersma, a pioneer in the study of the discipline in the early 90s, to current approaches in several US institutions. He discussed issues such as the language of judges and specific examples of the resolution of cases in which language had played a key role, and gave us a comprehensive list of the different scholars who have worked in law and language in the United States. 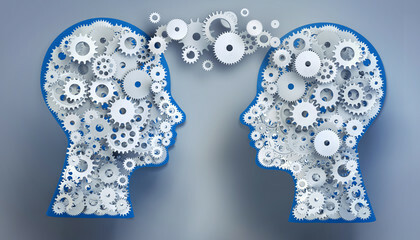 More recently, he mentioned the work that is being carried out at Brigham Young University (Utah) on the application of corpus linguistics to law, and he pointed out that more collaboration is needed to turn this methodology into empirical results. After a vibrant conversation about the contribution of linguistics in the training of judges, Ruth Breeze discussed the practice of law across media. She showed how law is portrayed through diverse media sources (mostly on websites and blogs). 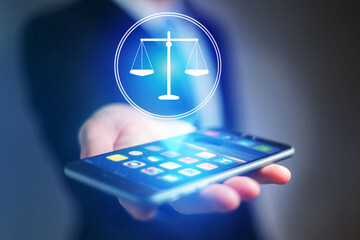 On the one hand, she focused on a range of resources that were available for the settlement of small-claim disputes through videoconference systems, which “change the way communication happens in legal settings”. On the other hand, based on these interactions, Breeze pointed out that these data are of particular interest for discourse analysis research. In summary, she showed how law has evolved through media and how technology is being introduced little by little despite entrenched traditions. Of special interest to our profession were the two panels chaired by Łucja Biel (University of Warsaw, Poland) and Vilelmini Sosoni (Ionian University, Greece). Well-recognised in the field of legal translation, these scholars organized two of the most stimulating and thought-provoking panels of the conference. The lectures took different perspectives: Jopek-Bosiacka (Warsaw) focused on legal theory and logic for quality in legal translation, with examples of errors resulting from a failure to use gender-neutral language in legal documents. Researchers from Birmingham Law School, Sophie Boyron and Aleksandra Cavoski, took the floor to discuss the importance of translation in two settings: while Boyron focused on particular examples of translation of constitutional French law, Cavoski described empirical research conducted on the challenges posed by the enlargements of the EU in Western Balkan countries. As she pointed out, “legal texts and legal languages are practically the same in these regions”, but it is still a major barrier in their accession to become Member States of the European Union. Equally interesting were the papers on Greek by Vilelmini Sosoni, who presented a comprehensive overview of translation manuals and drafting style guides on legal language and translation; and Polish, by Łucja Biel, who focused on the impact of the institutionalization of translation quality. She took specific patterns from her corpus-based study (using expressions like ‘must’, ‘should’, ‘is obliged to’) to highlight the growing textual fit of post-accession translation with the conventions established by a given target language. 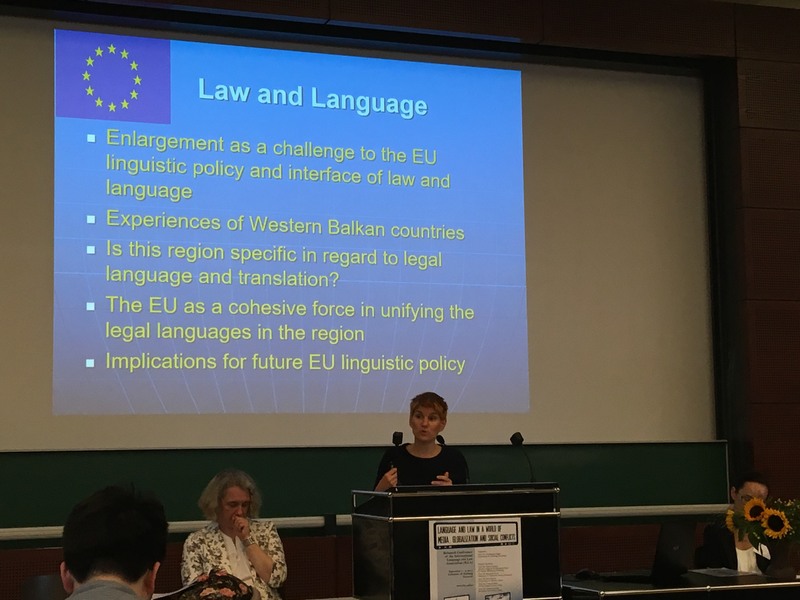 The first day concluded with a plenary from Ninon Colneric, former Judge at the European Court of Justice, on the language regime of the EU. This opened up the debate to various issues about the consequences of Brexit for European language policy, and questions on the role of English as lingua franca in the Union. The second day of the conference embraced a wide range of topics. From an analysis of the representation of law in the media in Poland to the misuse of translated legal terms in Chinese newspapers, among others. Professor Jan Engberg (Aarhus University, Denmark) had a very warm welcome with his paper on how legal knowledge is being constructed in institutions through multimedia resources. He compared how Danish and other European websites differ in presenting access to legal information and presented specific excerpts, and concluded that legal knowledge – and information about legal systems and procedures – is being opened up and becoming more widely accessible to citizens. 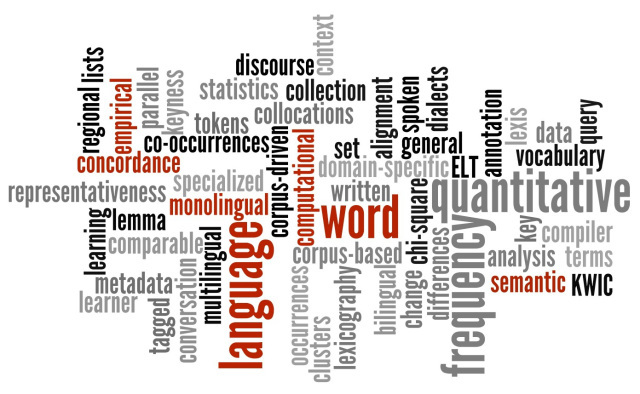 There is no doubt that, as we have mentioned before, corpus linguistics is here to stay in law and language. Two more presentations had corpus linguistics as the main research method: Professor Anne Lise Kjaer (Copenhagen) researched “effectiveness” patterns in case law of two European Courts and how its use was uncovering the emergence of neoliberal discourse in European Law. Aleksandar Trklja (Vienna University) showed us an innovative project that combined corpus and cognitive linguistics on the translation of judgments from the European Court of Justice and from the Supreme Court of the United Kingdom. The final day of the event closed with the plenary address of Professor Frances Olsen (UCLA Law School) on the creation of justice with language, who claimed that “one cannot omit the language of a world, because one is undoubtedly a part of it” and highlighted how language contributes to the construction of a social world. After all the lectures, it was time to celebrate the relaunch of the ILLA, which was chaired by Professor Dieter Stein. He made various announcements regarding the functioning of the association. 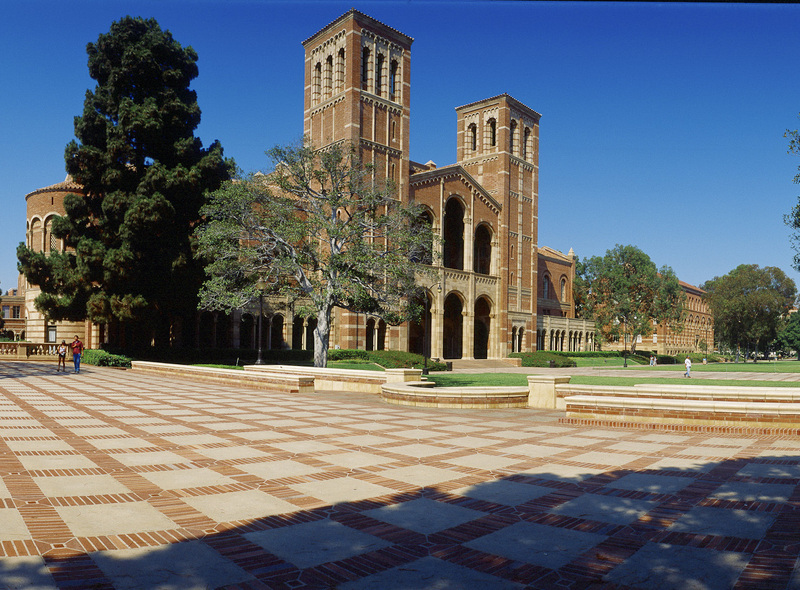 Prof. Friederman Vogel (Freiburg) and Prof. Frances Olsen (UCLA) were elected Presidents of the ILLA for the next two years and it was also agreed that the next ILLA Conference would be held in September 2019 at the University of California, Los Angeles. Aiming at contributing to the development of legal linguistics, Prof. Stein stated that ILLA would be supporting the organization of focus workshops in other institutions affiliated with the association; with the first one being organized by Professor Anne Lise Kjaer in Copenhagen next year. To sum up, this productive conference succeeded in opening up and stimulating dialog between two disciplines that are inter-related but that require more attention from both sides. What I found particularly rewarding from the event is to witness how legal scholars are more and more intrigued by how legal translators work and how translation can contribute to understanding the law. Looking forward to seeing you all in Los Angeles in two years for another successful ILLA conference! 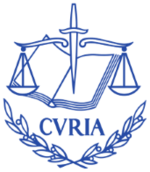 To find out more about the International Language and Law Association (ILLA), click here.